As companies strive to digitize document processes, IT needs solutions that integrate with—and extend the value of—the tools they’ve already invested in. Many businesses today use Microsoft apps to create, manage, and share documents both inside and outside the organization. And by adding Adobe Acrobat DC with PDF services to your company’s existing Microsoft workflows, you can help users across your company simplify day-to-day tasks and increase overall productivity. 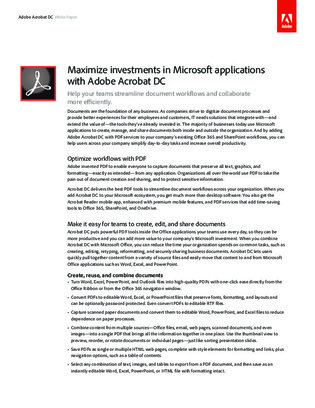 Download this white paper to learn how integrating the Adobe PDF tool with your Microsoft suite can help you streamline document workflows and collaborate more efficiently.